Queues outside post office in Clarehall, Dublin. 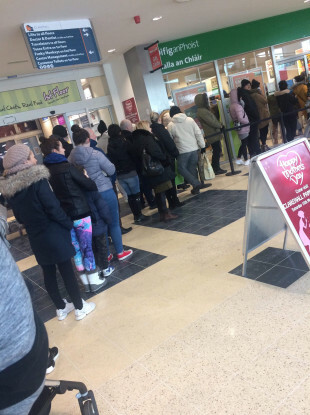 LARGE QUEUES HAVE been forming outside post offices as members of the public attempt to withdraw their social welfare payments before the storm hits. Photographs sent to TheJournal.ie show large crowds outside both Ballyfermot and Clarehall post offices. An Post issued a statement reminding its all customers due to collect social welfare payments that their payments will be available for collection when this period of bad weather passes. They urged customers to stay safe and not to make unnecessary journeys. Some post offices remained open from 9am – 1pm this afternoon. In other areas, normal services will be maintained where possible and depending on local weather and road conditions. Email “Large queues formed outside post offices ahead of lunchtime shutdown ”. Feedback on “Large queues formed outside post offices ahead of lunchtime shutdown ”.